In last week’s discussion on hacking brand strategy, I included the image above and briefly talked about brand personality. Today, I’d like to expand on the notion of brand personality and its value for your brand. Openness to experience – (inventive/curious vs. consistent/cautious). Appreciation for art, emotion, adventure, unusual ideas, curiosity, and variety of experience. Openness reflects the degree of intellectual curiosity, creativity and a preference for novelty and variety. Some disagreement remains about how to interpret the openness factor, which is sometimes called “intellect” rather than openness to experience. Neuroticism – (sensitive/nervous vs. secure/confident). The tendency to experience unpleasant emotions easily, such as anger, anxiety, depression, or vulnerability. Neuroticism also refers to the degree of emotional stability and impulse control, and is sometimes referred by its low pole – “emotional stability”. Brands have personalities that look a lot like consumer personalities, but the archetypes from Millward Brown’s graphic seem a better way to think about brand personality than the consumer groupings. Millward Brown combines several personality traits to come up with their archetypes. For instance, generous and caring combine to form the “Mother” personality. They then plot the archetypes along 2 axes — stability-change and well-being-challenge. Of course, this isn’t the only way to think of brand personality. Jennifer Aaker, who’s father, David Aaker is a branding leader, created this infographic depicting brand personality types. But, what is brand personality? Human traits or characteristics associated with a specific brand name. Common characteristics or traits represented include uniqueness, sincerity, intellectualism, competence, excitement and sophistication. The brand personalities gives consumers something with which they can relate, effectively increasing brand awareness and popularity. So, basically, consumers think about brands the same way they think about their friends, family, celebrities, co-workers, and public figures. We know consumers buy brands that resonate with them — that are “for me” — and brand personality is a big part of determining whether a brand is for me. 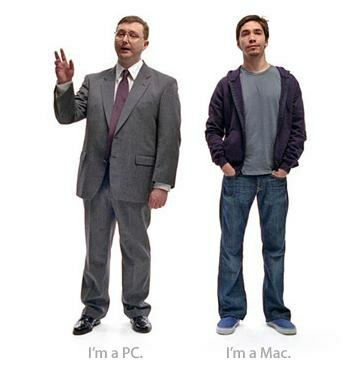 A good example is the recent Apple commercial “I’m a Mac”. The person representing the Mac is young, hip, and attractive. The actor representing a PC is dumpy, geeky, and generally unappealing. Which image do you think most consumers want to be? Sometimes it isn’t a function of what you want to look like, but what your value system looks like. That’s why consumers favor brands that are good corporate citizens. For instance, if I’m gonna eat fast food, I’m gonna choose McDonald’s because they support the Ronald McDonald’s houses and donated generously when I needed help with a fundraising project. Consumers vote with their dollars and they vote their conscience. Brand personality helps in planning your marketing campaigns. Marketers use brand personality to determine the messages, media, sponsorships, and partnerships appropriate for maintaining a consistent personality that resonates with consumers. Ultimately, understanding a brand personality enables the brand owner to deliver a consistent brand experience that connects with consumers and leaves a deeper and more sustainable impression. So, which brand personality or brand archetype is right? There is no one brand archetype that is right. Any archetype can lead to success. The right brand archetype is the one that resonates with your target markets — or market personas. That said, some archetypes correlate with success, according to Millward Brown’s Global 100 brands (see except below). Specifically, the WISE brand archetype,. including Google and Visa, reflects many of in the top 100. SEDUCTRESS brands like L’Oreal and Louis Vuitton, succeeds by being distinct and attractive. FRIEND brands like Home Depot and KFC are well-known to consumers, creating success for their brands. The MAIDEN brand is the only one that doesn’t seem to resonate well with consumers, maybe because innocence doesn’t resonate well in terms of a brand personality. Too often, marketers think of brand personality in terms of the logo or other visual branding elements — color, graphics, brand name. Brand personality is much more than these simple graphic elements, although visual identity is important for developing and maintaining your brand personality. If you’re interested in crafting a personality for your brand, you need to look to every aspect of the brand including product and package styling, customer service, and other elements related to the product itself. More important are the mission and values inherent in the parent company. Next, look at your value propositions. Do they match the personality you’re going for. A key element of a good brand personality is consistency — the logo supports the same personality as product styling and your mission is consistent with your personality. All that is a very tall order, but if you look at the brands consistently leading as top brands, you find they all have strong brand personalities and maintain their branding while matching their brand to prevailing trends.